This free exhibition of work from the De Morgan Foundation's collection opened on 11 May 2018 and runs until 28 October 2018. It is in the Guildhall Art Gallery, off Gresham Street in the City of London. For more details, see offsite here. The author took the photographs below while visiting the exhibition: thank you to both the De Morgan Foundation and the Guildhall Art Gallery for permitting photography there. Click on the images to enlarge them. Front, left to right: (a) Tin-glazed floral dish with raised boss (1872-1907). (b) Gold lustre glazed swan and winged dragon dish (from the Chelsea period, 1872-82). (c) Tin-glazed Persian coloured rice dish (1872-1907). Behind are a dish with a floral pattern and another featuring a crow both with distinctive borders (twining snakes on the left, and circling figures on the right). 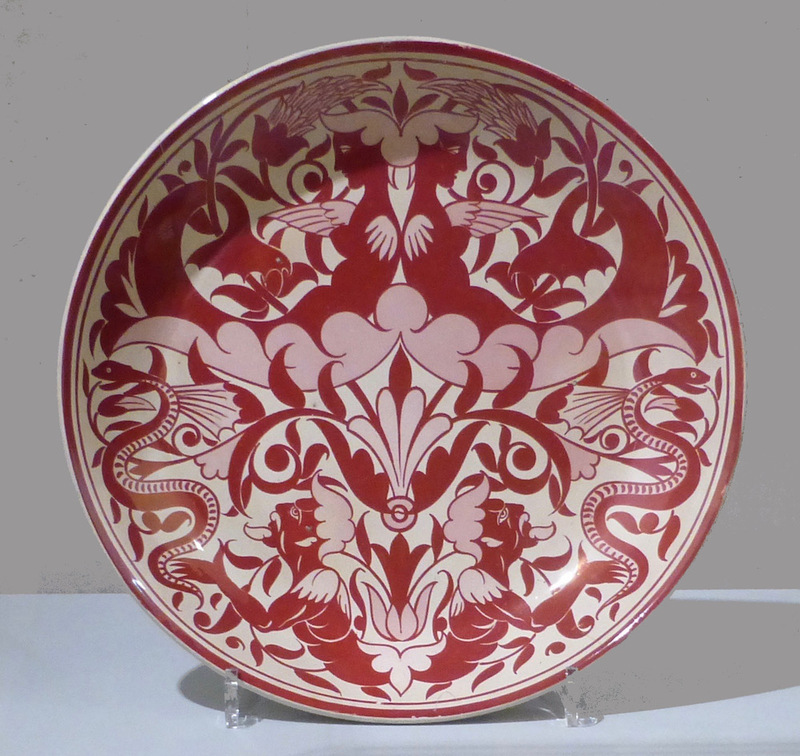 William De Morgan (1839-1917) was one of the finest ceramic artists of his age. In common with fellow-Victorians in different creative fields, from architect and designer William Burges to children's author Lewis Carroll (who was a friend of his), he had a quirky sense of humour that enlivened his creations and helped to make them unique. As can be seen in the display cabinet shown above, there might be dragons on his plates, or comically angry birds, or a positive infestation of snakes. But do we give full credit to his compositional skills? Sarah Hardy, who curated the current touring exhibition and wrote its catalogue, thinks not, and sets out to help us appreciate the underlying forms in which De Morgan expressed his often playful vision. 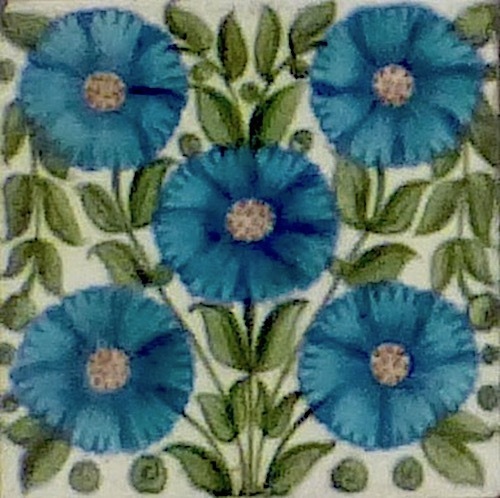 An early work: the perfectly symmetrical and stylised Bedford Park Anemone tile. In stressing the mathematical principles and properties in his designs, Hardy is on sure ground. De Morgan's father was the influential mathematician Augustus De Morgan (1806-1871), and he himself studied mathematics during his year at University College, London. He even expressed particular enthusiasm about Book I of Euclid's Elements, which deals with plane geometry (see Hardy 24). This interest manifests itself in his work from the start. Hardy describes his early floral patterns as quite basic ones, "which feature flattened, stylised flowers," but even these "are structured round a central line of symmetry" (08). At first, she explains, he was influenced also by the principles of medieval design admired and promoted by A. W. N. Pugin and John Ruskin, and embodied in Pre-Raphaelite art. De Morgan was, after all, a man of his age. 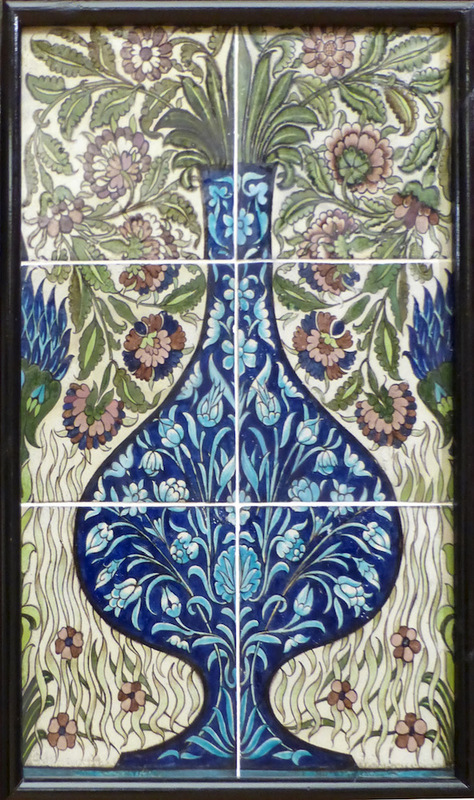 But by the time he was commissioned to instal Lord Leighton's tile collection in the Arab Hall at Leighton House, he was already developing an interest in more exotic artwork of Middle Eastern and Turkish origin. 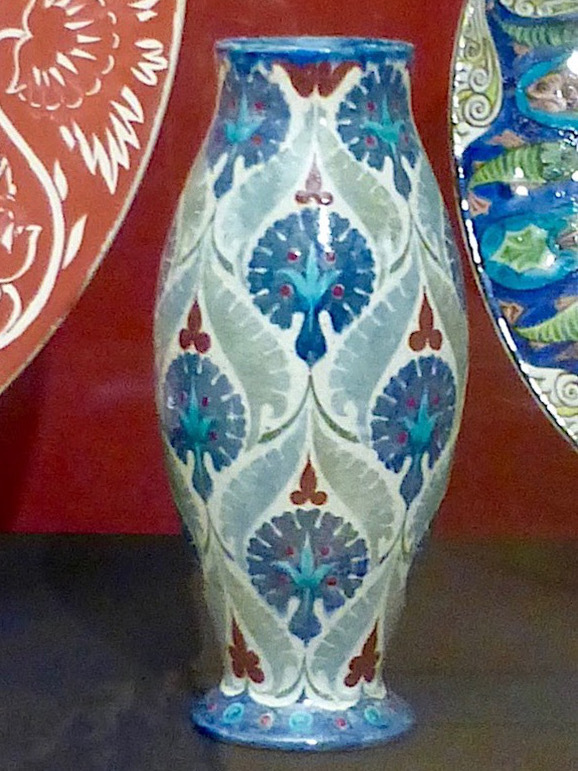 The style of late fifteenth-century tiles made in Iznic, in Turkey, appealed to him greatly, and it was not just because of their palette: he began to adopt both their bright hues (especially blue, green and red) and their "formalised floral designs ... geometrically structured, with symmetry being a key device underpinning many of the motifs" (10). These influences, and the various stages of his career as a ceramicist – from his early days with William Morris to his "Chelsea Period" onwards — are a staple of De Morgan studies. But Hardy's emphasis on the structure of his designs not only supplies a unifying thread in his development, but also provides another entry into his oeuvre. She explores the various distinct ways in which he exploited the properties and potentials of circles (particularly prevalent in Islamic designs), squares and triangles, along with the increasing complexity of his patterns. Hers are not theoretical findings, but ones firmly based on original drawings and schemes that show his "rigorous geometric planning" as well as helping to account for his mastery in realising his designs in three dimensions (03). Left: Mermaid Plate, in which each half of the design matches the other. Right: Bee Plate. For example, we are shown the original drawing for the Mermaid Plate shown on the right. In a process called "pouncing," Hardy explains, "tiny pinpricks were first punched into the paper along all of the lines. Then charcoal was rubbed through them onto the ceramic underneath, before being filled in with the coloured glaze" (14). The paper was then flipped over to transpose the deign onto the other half of the plate. Circular symmetry, with its suggestion of infinity, is particularly potent. Not even the most elaborate ornamentation can overwhelm it. Indeed, it provides useful definition to the intricacies, by containing them. 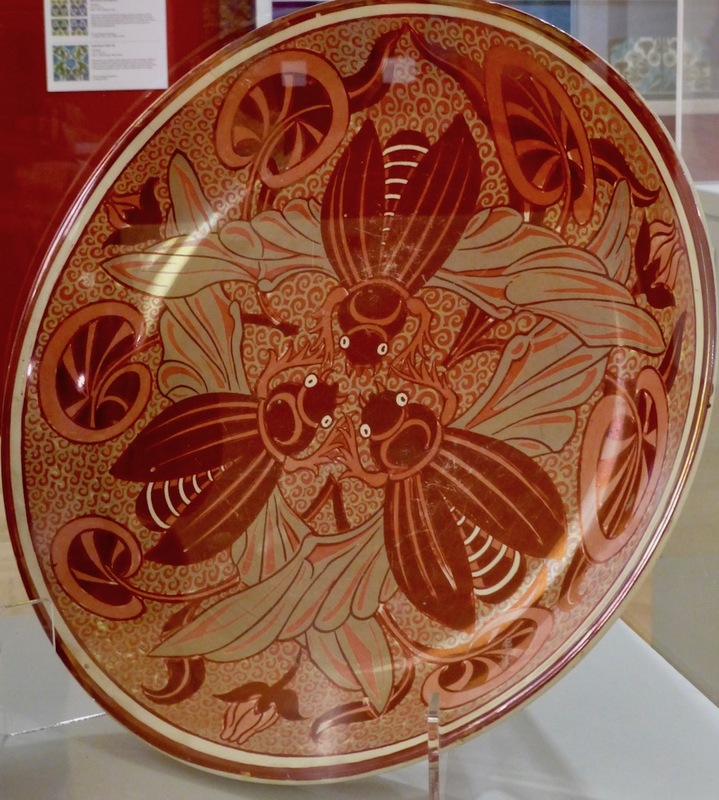 De Morgan's methodology is illustrated by the Bee Plate, in which he has used the properties of triangles as well, laying out his three insects "so that their bodies are arranged round one triangle and their wings a second." Hardy goes on to note: "His spacing of the bodies and the wings is such that the distance between each, if extended to the edge of the circle, would measure the same as the radius of the circular plate on which they are emblazoned" (26). Many will respond to the unusual bee motif, perhaps remembering that bees actually do a round "dance" after returning to the hive, to communicate the location of a food source. But, without Hardy's help, would they realise how cleverly the effect has been achieved? Left: Floral ogee tile panel. Middle two: Scarlet Macaws and Blue Fronted Amazon Parrot tile panels. Right: Fan tile panel. Geometrical shapes play some less obvious parts in De Morgan's output, too. Hardy suggests that the various circular secondary designs on the back of plates and bowls not only complement the primary designs, and indicate that the items were individually handmade, but demonstrate "the never-ending circle of design and manufacture that was so important to De Morgan" in the context of the Arts and Crafts Movement in which he was now working (25). Examples here, already on our website, include the Triple Lustre "Serpent Island" Dish and the Ruby Lustre Plate decorated with a "Manned Galleon" design. Triangles could serve different functions, either as containing borders, or as part of interlocking patterns, as in the Bee Plate already discussed. Squares of course are a given in tiling, though De Morgan often "softens" them by placing circular motifs or frames within them. Flowing lines that cut across the squares — the thick scrolling vines, for instance, in the parrot panels shown immediately above, also carry the eye beyond the borders and give a sense of movement. Whether used for containment or interrupted for continuity, shape was vitally important to De Morgan. Left: Vase with flowers tile panel. Right: A small vase decorated in Persian style, based on circular flower-heads framed by triangle/inverted triangle lozenges. When it came to the three-dimensional work of 1882 onwards, produced after he had moved his operations to Merton Abbey, De Morgan seems to have depended as much on the proficiency of his "small team" of assistants (26) as on his own technical expertise. An instruction on one of his drawings, for instance, simply requires the pattern to "be cleverly spread out and adjusted so as to make it cover the whole of this side of the vase neatly" (qtd. p.27). Nevertheless, as the two illustrations on the left suggest, Hardy's point about De Morgan's use of mathematical structures still holds true. Whether in tiles or hollowware, these structures give form, clarity and impact to his work. As a title for an exhibition, "Sublime Symmetry" sounds rather earnest and high-flown. In fact Hardy makes it clear that De Morgan was just as playfully inventive with his mathematical knowledge as he was with his interest in natural history. The teacher's pack for the exhibition bears that out, supplementing the displays for younger visitors with some brilliant worksheets on shapes and ways of manipulating them. 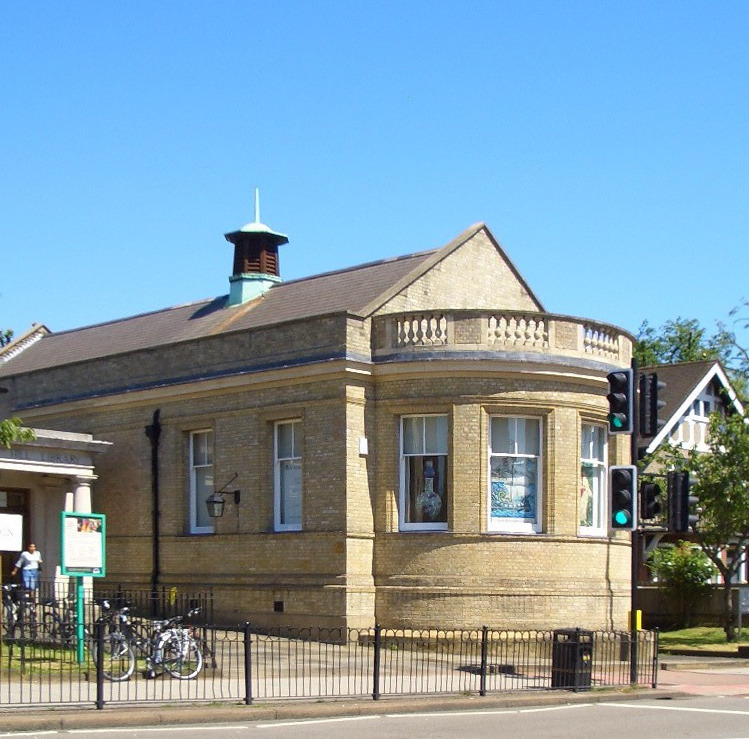 Please note that the De Morgan Foundation, formerly based at West Hill, Wandsworth, now has a long-term agreement with, and dedicated space at, the Watts Gallery in Compton, near Guildford in Surrey. Like the Guildhall Art Gallery, this is a fabulous place to visit. Focused and informative, the touring exhibition is a great way of keeping De Morgan in the public eye, and if it encourages people to go further afield to see more of his work, so much the better. Hardy, Sarah. 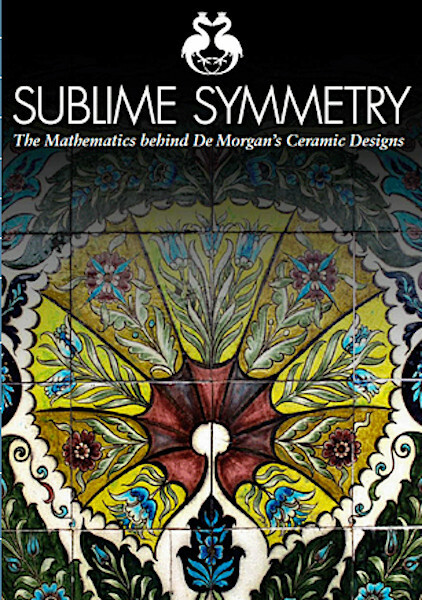 Sublime Symmetry: The Mathematics behind De Morgan's Designs. Compton, Guildford, Surrey: The De Morgan Foundation, 2016. 36 pp. Available at the exhibition. £3.50. (For further information about the Foundation, please visit their website).